I discovered this delicious cake on a visit back east this summer. A friend of mine had made it and it sounded so easy and good I decided to try it for myself. As usual I tweaked the recipe to my liking and have since made it several times for family and friends of all dietary backgrounds. Only two people, you know who you are, didn’t care for the cake, but my two daughters were not among them so I consider that a success. My daughters are my toughest critics and usually ask if I made the dessert, when I answer yes, that is enough to turn them away, yes stinkpots they are!! So after a somewhat involved recipe last post, here is a fast easy tasty dessert that most people will love. Place all ingredients into a blender and blend until well mixed. 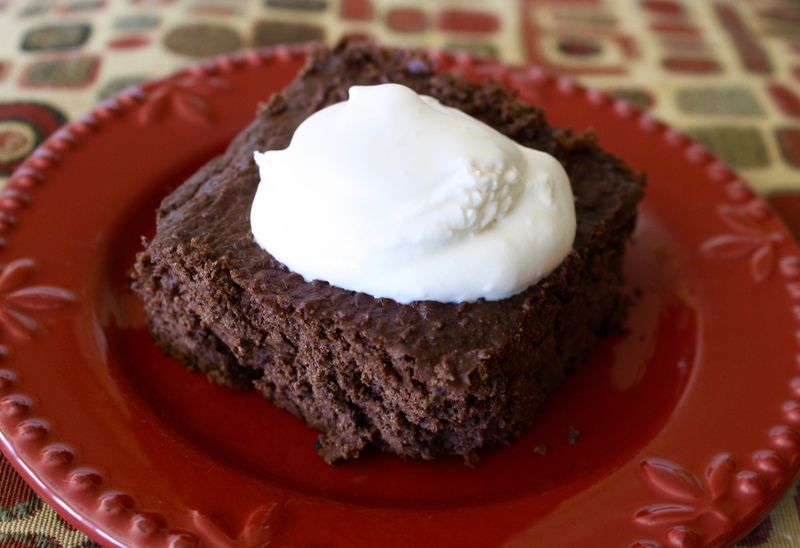 Pour batter into a 8×8 greased baking pan. Feel free to mix in a few more chocolate chips if you like chocolate a lot. Bake at *350 degrees for about 18-25 minutes until the center is firm be careful not to over bake. Let cool and eat plain or frost with my whipped cream/ Cream cheese Frosting (recipe below) or plain whipped cream. 1 8oz package organic cream cheese room temp. Whip the cream into firm peaks add the softened cream cheese and whip until smooth add the vanilla and maple syrup.